Our optometrist in Maple Ridge, BC gets asked about age-related macular degeneration (AMD) on a regular basis. It is one of the more common eye conditions seen in optometry practices and affects mostly older adults, thus the name. There are two forms of the condition, dry and wet macular degeneration. Our Maple Ridge optometrist has provided answers to some of the most frequently asked questions we receive about macular degeneration. Q. What is macular degeneration? A. Macular degeneration is a condition in which the cells of the macula, which is in the center of the retina, begin to fail. This causes blurring and eventually blind spots in the central vision. The dry form of the disease is characterized by damage related to thinning of the macula and/or pigment deposition in the area. The wet form, which is the more severe version of the condition, is characterized by the growth of abnormal blood vessels in the area. Q. 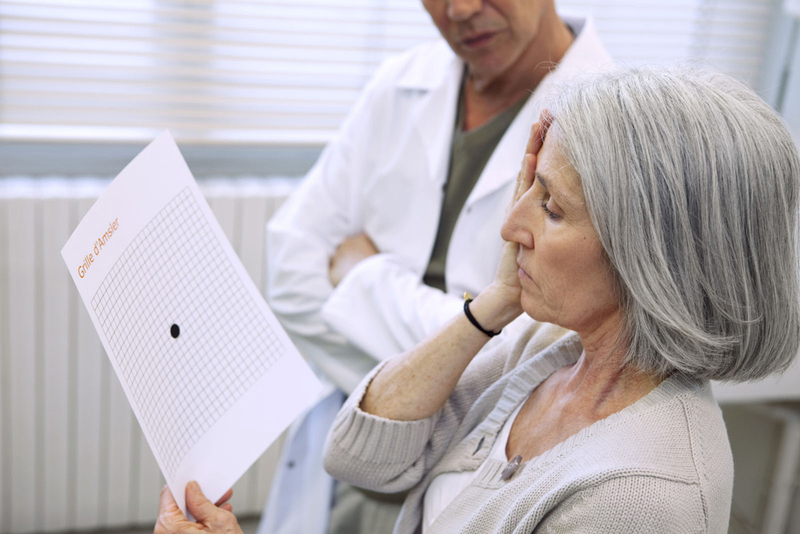 What are some symptoms of macular degeneration? The first symptom of macular degeneration is usually a subtle blurriness in the center of your vision. However, this can be a symptom of many conditions, so it requires an eye exam from a licensed optometrist in order to make a diagnosis. As the condition progresses, the blurry spots may become dark spots, eventually leading to total loss of central vision in some people. Macular degeneration does not cause the loss of peripheral vision, so even people with the advanced disease will usually be able to see with their side vision. Q. Who gets macular degeneration? It is not known why some people with many risk factors do not develop the disease and some people with few risk factors do. Q. What is the treatment for macular degeneration? A. There is currently no treatment for dry macular degeneration except dietary intervention. Some studies have shown that certain supplements can help prevent the condition from progressing or prevent it in people who are at risk but do not yet have AMD. Treatment for the wet form of the disease involves the use of injections or even a tiny implantable telescope for some people with severely impaired vision in both eyes. Regular screenings and eye exams are important to diagnose and manage conditions such as macular degeneration. At our Maple Ridge optometry clinic, we can give you guidance regarding the latest and best treatment options for AMD. An eye exam is the best way to check for many different eye diseases, not just macular degeneration. To make an appointment at Maple Ridge Eye Care, call 604-670-4434 We serve Maple Ridge, BC, and the surrounding areas.